Since my first Easter in Ireland in 2012 I’ve been fascinated by the giant chocolate eggs that are the tradition here. It wasn’t until this year that I realized I hadn’t seen a single bag of jelly beans in the Easter candy aisle – anywhere! Here, it all about the chocolate. Chocolate eggs from miniature Lindor truffle eggs to Butler’s extra large eggs and everything in between. The most popular candy bars have their own egg box which contains a milk chocolate hollow egg and a few snack size varieties of said candy bar in the likes of Crunchy, Kit Kat, Rollo, Mars, and more including an Oreo one as well. I covered some of those in the first post. 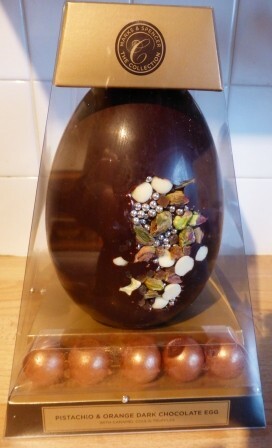 Last year I kicked it up a notch to Lindor and Lily O’Brien (that Bailey’s egg was the bomb!). 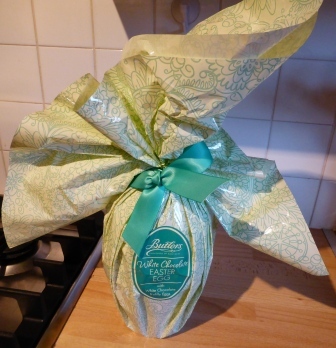 At the top of the range are the Butler’s and the specialty eggs made by niche chocolatiers that can actually get pretty expensive (nearly €30 or almost $40 US for a medium chocolate egg)! 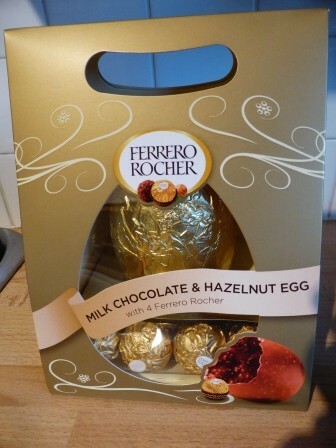 One I saw at Marks and Spencer had edible gold filigree on the front half of the egg. 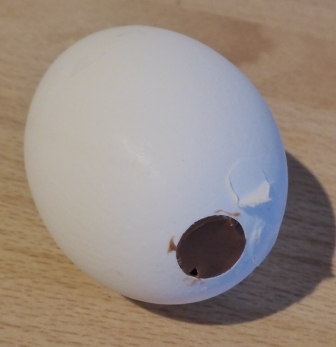 If it had been tax deductible as a blogging expense I might have bought one of those pricey ones, but as much as I like chocolate, I can’t justify that kind of money for a hollow egg. However, that doesn’t mean I’m going without this year, far from it. I picked up a Ferrero Rocher egg, which is more than just plain milk chocolate and comes with an assortment of Ferrero Rocher candies. This one was actually courtesy of the National Lottery Easter scratch card where one of the prizes was your choice of chocolate (to a limit of €6 – I kicked in an extra €2 to get this one). 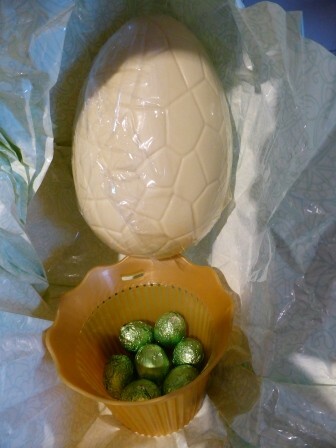 Next I bought a Butler’s large egg – one of the few available in white chocolate, my personal favorite. I was hoping to get one of the extra large varieties to show you how big they can get but all I could find in that size were milk chocolate. These come in a lovely wrap and are actually sitting in a small plastic Easter basket filled with truffle eggs. 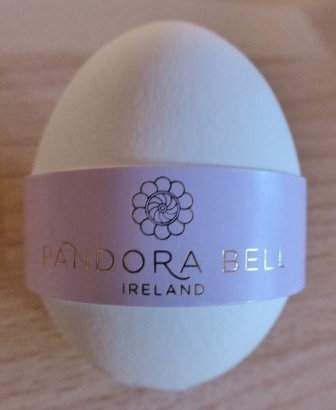 Last week when I was in Galway I spied these Pandora Bell eggs – a real hollowed out egg shell filled with a praline chocolate mixture. In the top end of what I was willing to pay was this Dark Chocolate with Pistachio and Orange egg which comes with an assortment of edible copper over chocolate covered caramel balls. Oddly enough, Cadbury still haven’t released the dark chocolate version of their eggs in a candy shell that are available in the US. Obviously they haven’t read my blog plea from 2012! Whatever your preference, be it jelly beans, Peeps, chocolate or any of the other myriad varieties of Easter candy, I hope you have a wonderful holiday. I expect to be enjoying the spoils of my egg hunt well into the summer! Happy Easter Dawn! Love your posts! Your photos make those candies look so yummy, Dawn! I hope you had a delightful Easter.